A wonderful dish, raising simple “old world ” peasants stew- to a complex, full body depth; capable of transcending you to your comfortable warm happy place! A bit time consuming– but worth every moment and hopefully, it won’t take you as long to cook it, as long as it took me to write it! 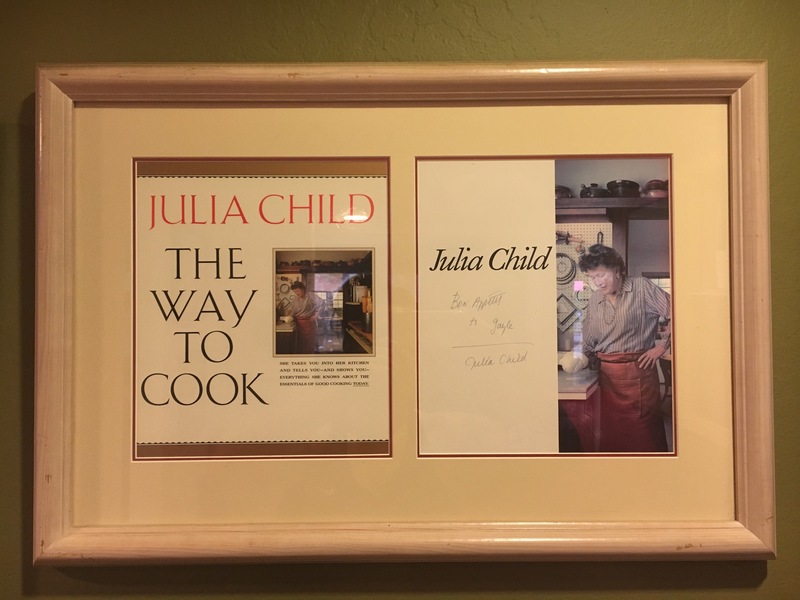 Just so happens I met Julia in my younger culinary days and have her book, “The Way To Cook” autographed by Julia Child’s herself! A day I will never forget! 3 pounds beef for stew -or cut your meat into about 2-inch chunks. Acceptable cuts -rump, chuck, sirloin tip, top round, or bottom round. 1-Preheat oven to 450’F degrees. In a large heavy bottomed 8 quart stock pot, or enamel Dutch oven- heat the olive oil over medium-high heat. Cook bacon for 5-8 minutes until browned, and fat has rendered to the bottom of the cooking vessel. Remove bacon with a slotted spoon onto a paper towel. Set aside. 2-Pat the beef dry with a paper towel, and season with salt and pepper toss in flour. Shake. 3-Heat the olive oil with the rendered bacon fat- to high heat. When shimmering, add the seasoned, floured beef, in batches – do not crown the pan. Brown the beef well on all sides. Remove and set aside. 5-Deglaze the pan with the red wine making sure to scrape all the brown bits from the bottom of the pan. Add the stock,tomato paste,herbs and the garlic. Stir to combine. 6-Return the beef and bacon to this vessel. Cover. Reduce oven heat to 325’F and place vessel in the oven and cook about 3 to 4 hours. Now prepare the onions and the mushrooms. 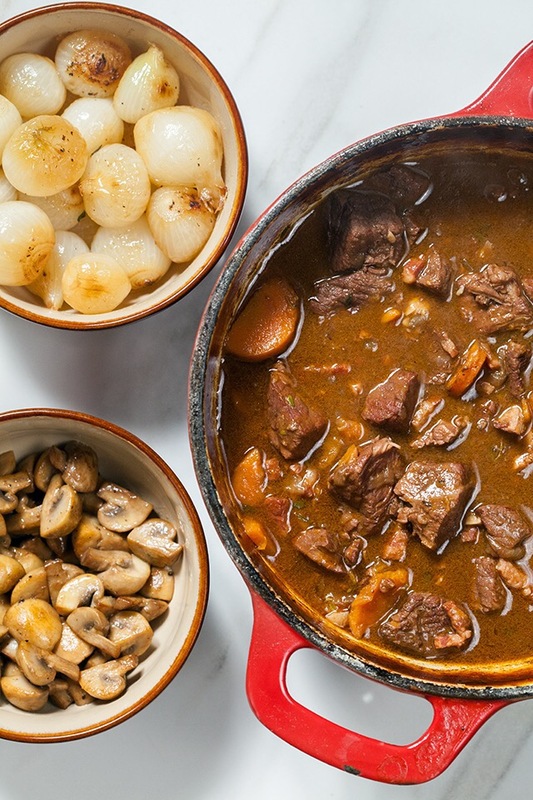 Add both mushrooms and onions to the pot and keep covered and continue cooking until beef is fork tender and liquid reduced to a stew like consistency. Serve with any style potatoes or enjoy on its own! 1-Heat the butter and oil in a skillet over medium-high heat. Add the par-boiled, peeled pearl onions. Sauté for about 10 -12 minutes, until the onions are chocolate brown and caramelized. 3-Tie the herbs together with butcher’s twine, or wrap inside kitchen cheesecloth. Add those in, too. Reduce the heat to low, cover, and simmer for about 5 minutes to marry flavors. Add to main pot in the oven. Stir in well including the herb bundle. Heat the oil and butter in a skillet over high heat. When the foam from the butter begins to subside, add in the mushrooms. Add garlic. Shake the mushroom around for about 5 minutes until toasty brown. Remove from heat and also add to the main pot in the oven.